Power, efficiency, style, versatility. All are good things to look for in a car. But why stop with getting just one? The 2017 Toyota Prius V has it all and will deliver an amazing driving experience every day. Come and see the 2017 Toyota Prius V, available now at Lakeland Toyota in Lakeland, FL. This stylish hatchback provides exceptional cargo space and enough rear seat room to accommodate even tall passengers with ease. What's more, it offers up excellent fuel economy numbers, earning an EPA-estimates 43 miles per gallon city and 39 miles per gallon highway, which is more than many mid-size sedans and wagons can do on their best days. Come and see the big brother of the Toyota Prius at Lakeland Toyota. Our spacious Toyota showroom is located at 2925 Mall Hill Drive in Lakeland, FL just minutes from anywhere in Brandon or Plant City. Enjoy the high-tech interior, comfortable seats, and easy-to-configure cargo area of the 2017 Prius V at our Toyota dealer in Lakeland. The Prius V is every efficient, dependable, and safety-minded; so it's great for families. Lakeland Toyota has been serving shoppers from Plant City and Brandon as well as the surrounding areas of Florida for many years, connecting drivers with efficient and reliable Toyota hybrid vehicles. Come and explore the family-friendly 2017 Toyota Prius V at our Lakeland Toyota showroom. If you want a stylish and versatile hybrid wagon for your family, you will get the best of both worlds in the 2017 Toyota Prius V. This stately hatchback got a fresh design update a couple years ago that made it even more eye-catching. New design features on the 2017 Prius V include slimmer headlamps and an updated hood that accentuate the sharp grille and dramatic sidelines. The Prius V got a wider and lower stance thanks to some thick cutaways in the body panels, as well as new, lower-profile cosmetic changes to the side body panels that improve aerodynamics. The new shape of the Prius V's sheet metal helps to maximize fuel economy by allowing the Prius V to slice through the air even better than before. The 2017 Toyota Prius V has the look that says is can talk the talk, and when you come to Lakeland Toyota for a test drive, you will see it can walk the walk. When you shop at Lakeland Toyota, you will find a wide selection of new Prius V models in stock at our new Toyota dealership. Choose the trim grade that fits your budget best from the Prius V Two, Prius V Three, Prius V Four, and Prius V Five. The interior of the 2017 Prius V is in a word, cavernous, with 34.3 cubic feet of cargo space behind the rear seats that expands to 40.2 cubic feet when the rear seats slide forward on their track, and a large number of small-item storage compartments exactly where you need them. Thanks to extended leg and head room in the rear seats as well as the well-bolstered cushions that have been updated with new materials for 2017, the Prius V will be a haven for passengers of all heights on long drives. The 60/40 split rear seats can also be folded down to open up 67.3 cubic feet of total cargo volume; they also recline and slide fore and aft on a track, so you can easily reconfigure your Prius V's interior to suit your needs. Fold the front passenger seat flat (a standard feature in every model) and your Prius V will be able to accommodate long cargo items with ease. The Prius V features either cloth or SofTex upholstery, depending on the trim you select. No matter which 2017 Prius V you choose, you will be treated to a comfortable, convenient, and quiet ride. The 2017 Toyota Prius V makes it easy to save money at the gas station in more ways than one. On top of its amazing hybrid powertrain that offers mile after mile of efficient performance, you get an eco-coaching system that trains you to drive greener. The Prius V will score your driving habits on a scale of 1 to 100, and the closer you get to 100, the more efficiently you are using your Prius V. Simple! The 2017 Prius V also features a three-mode drive selector that will help you get the most out of every tank of gas. The Prius V's ECO mode dampens the throttle response and allows for more efficient driving over a longer period; EV mode powers the Prius V with 100% electric energy for up to one mile; and POWER mode improves throttle response and reactivity to provide you with highway-eating performance. All of that astonishing technology is powered by the 2017 Toyota Prius V's exceptional powertrain, which consists of a 1.8-liter gasoline combustion engine connected to a sealed nickel-metal hydride battery pack and an AC synchronous electric motor. This Earth-friendly powertrain provides drivers with 134 net horsepower and 258 net pound-feet of torque, which is the perfect amount of power for every commute. The amazing amount of torque produced by the hybrid powertrain is more than enough to start strong off the line or merge onto a busy highway at speed. Safety features are important in any vehicle, and in family vehicles that regularly transport the most precious of cargo, they are essential. The standard safety features in the 2017 Prius V have been upgraded and now include the Toyota Star Safety system which includes anti-lock brakes, electronic brake-force distribution, a tire pressure monitoring system, vehicle stability and traction control, brake assist, and Toyota Smart Stop Technology; front seats with whiplash lessening headrests, a bevy of airbags including a driver knee-area airbag; LATCH child seat safety position for the rear outboard seats, and a vehicle proximity notification system. If you add the Advanced Technology Package to the 2017 Prius V Five, your vehicle will come with Toyota Safety Connect (a one-year subscription for emergency and roadside assistance services as well as an automatic emergency notification system), a Pre-Collision System, Lane Departure Alert, and Automatic High Beam control. Of course, every 2017 Prius V comes with two years or 25,000 miles of ToyotaCare no-cost maintenance and roadside assistance. If you are wondering how it would feel to drive a spacious and versatile car that is powered by Toyota's amazing eco-friendly technology, come and see the 2017 Toyota Prius V at Lakeland Toyota. Our Toyota dealership in Lakeland is located at 2925 Mall Hill Drive, and we have a wide selection of new Toyota models including the 2017 Toyota Prius V in stock. You will love driving this family-friendly vehicle that offers space enough for everyone as well as all of their essentials - and a few extras, too! 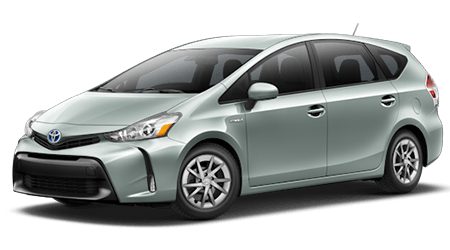 Come and view our inventory of new Prius V wagons in stock near the areas of Brandon and Plant City, FL as well as the surrounding areas of Florida. Come and find a new Toyota that suits your needs at Lakeland Toyota!